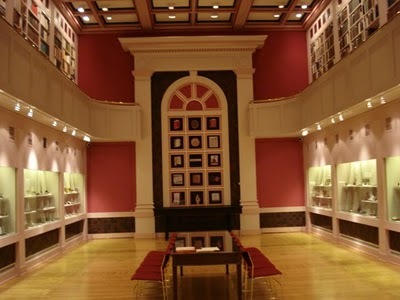 The Grolier Club of New York City has fostered interest in, and support for, book arts for more than 125 years. It also offers regular exhibitions, displays, lectures and publications on publishing, printing, libraries, book art and the book trade at its elegant East Side location. This December, French national treasures from the Imprimerie Nationale will be on public view in the largest exhibition ever presented at the Grolier Club. Highlighting the history of the Imprimerie Nationale, arguably the most important printing house in Europe, the comprehensive exhibition Printing for Kingdom, Empire, and Republic: Treasures from the Archives of the Imprimerie Nationale lavishly documents nearly five centuries of printing art and craft. These books, manuscripts, and objects from their archives have never before left France and will be seen for the first time at the Grolier Club, New York City. 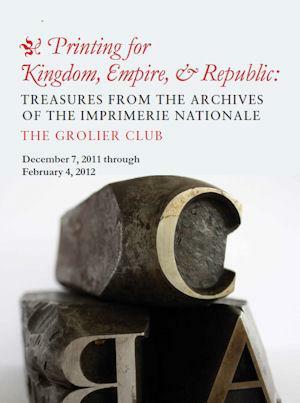 On view from December 7, 2011 through February 4, 2012, the exhibition includes more than 200 prized possessions drawn from the vast holdings of the Imprimerie Nationale. It has been organized by H. George Fletcher, retired Brooke Russell Astor Director at The New York Public Library. A major publication, printed in Garamond by the Imprimerie National’s Atelier du Livre d’Art et l’Estampe, will accompany the exhibition. On the schedule is a full calendar of events, including demonstrations of printing processes, lectures, and a day-long colloquium. For an updated list of related events please click here. This entry was posted in Art, Books, History, Libraries, Museums, Uncategorized, USA, Writing and tagged Book Artists, France, Garamond, Grolier Club, Imprimerie Nationale, New York City, New York Public Library. Bookmark the permalink.